Surgery and radiation are considered the standard of care for estrogen receptor–negative (ER–) breast cancer. However, adjuvant chemotherapy may have a role in treating isolated ER– breast cancer recurrences, according to results of the Chemotherapy as Adjuvant for Locally Recurrent Breast Cancer (CALOR) trial presented at the CTRC-AACR San Antonio Breast Cancer Symposium (SABCS). The study showed that adjuvant chemotherapy improved disease-free survival (DFS) and overall survival (OS) for patients with breast cancer, especially those who had an isolated local recurrence of ER– breast cancer after surgery. ER– recurrences are not considered sensitive to hormonal therapy, and CALOR is the first randomized controlled trial to provide some definitive guidance for these patients, explained lead author Stefan Aebi, MD, head of the division of medical oncology at Luzerner Kantonsspital in Lucerne, Switzerland. 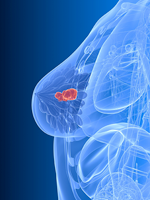 “Optimal treatment for the breast cancer patient with an isolated recurrence in the breast or surrounding tissue has been debated. Disease-free survival at 5 years is about 50% for these patients. Previous attempts to study this have been unsuccessful. For the first time, a global trial provides an answer to this question,” he stated. In the CALOR study, 162 patients with an isolated local and/or regional recurrence treated surgically were randomized to receive chemotherapy or no chemotherapy. Patients also could receive radiation therapy for microscopically positive margins, hormone therapy if the tumor was hormone receptor–positive, and anti–human epidermal growth factor 2 (anti-HER2) therapy for HER2+ tumors. Patients were enrolled in CALOR after primary surgery with clinically negative margins. After surgery for an isolated local recurrence, patients were stratified according to prior chemotherapy, hormone receptor status, and recurrence location. Originally, investigators sought to enroll 977 patients, but accrual was very slow and only 162 patients were enrolled. Baseline characteristics were well balanced for primary surgery, chemotherapy, median time to local recurrence, site of recurrence, and hormone receptor expression. Median age was 56 years, and 75% were postmenopausal. At a median follow-up of 5 years, DFS was 69% in the chemotherapy arm compared with 57% in the no-chemotherapy arm (P = .046), for a 31% reduction in risk of disease progression. Five-year OS was 88% versus 76% (P = .02) in the chemotherapy arm versus the no-chemotherapy arm, respectively, for a 59% reduction in risk of dying. The absolute difference between groups was 12% for both DFS and OS. The data for chemotherapy were even more robust in ER– patients, with a 77% reduction in risk of disease progression. For patients with ER– recurrences, 5-year DFS was 67% for those who received chemotherapy compared with 35% for those who did not; OS rates were 79% versus 69%, respectively. Aebi S, Gelber S, Lang I, et al. Chemotherapy prolongs survival for isolated local or regional recurrence of breast cancer: The CALOR trial (Chemotherapy as Adjuvant for Locally Recurrent breast cancer; IBCSG 27-02, NSABP B-37, BIG 1-02). Presented at: 2012 CTRC-AACR San Antonio Breast Cancer Symposium; December 4-8, 2012; San Antonio, TX. Abstract S3-2.